So my 13 month old daughter has her one billionth cold right now. Nothing serious – runny nose, slight cough, - oh yeah – and disrupted sleep. There is lots of talk out there about why it is “good” for kids to get sick. Mainly the conventional wisdom says that it helps them build up their immunities for later in life. If they don’t get sick now, they will get sick later. It makes sense to me right now, in the middle of the day, when I am sitting at my computer with a cup of coffee. It makes less sense to me, however, at 4:30 in the morning when I am trying to soothe my sad, sniffly daughter back to sleep for the third time that night. But whether it is actually good in the long run or not, the fact of the matter is that your child will get sick, and will probably get sick with some frequency in the first few years of his/her life. 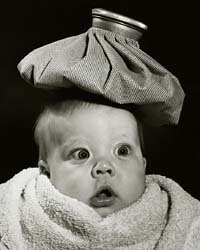 Since there really is no way to avoid the common colds for these little ones, what can you do about it? If, like me, your child is in daycare, or you bring your child out to the children’s museum, the museum of science, playdates, or really outside for any reason – then your child will get sick so the question isn’t so much how to avoid the cold, but what to do about it when it happens. First – saline drops. My daughter screams her head off every time I try to get them into her. For the first few colds, I just quit doing it because I felt like I was torturing her, but after a few lengthy colds, I discovered that it really does help with the runny nose and it especially helps to keep a runny nose from turning into chest congestion. One suggestion – the doctor’s office has small, single dose saline droppers that they use (sort of like sample droppers). These are MUCH easier to get into a little nose than the giant “infant saline” droppers that you pick up at the store. Next time you have an appointment, whether your child is sick or not, ask for a couple of these sample droppers. Also – hydrate, hydrate, hydrate. In addition to milk, I give my daughter tons of water, chicken broth in a sippy cup, and sometimes some watered down OJ. The more she pees, the quicker she recovers. Lastly, I have found that boggie wipes which are just wipes soaked in saline, make nose wiping much more tolerable for my daughter than just using a tissue. If you don’t have boogie wipes, a warm wet paper towel works just as well. All good suggestions. I just wanted to add that, as hard as it was for me to believe that being sick when they're younger builds up their immune system, especially since it seemed like Jack was ALWAYS sick during the 1st year of Jack's life, he has been (knock on wood) illness-free since June & he's currently almost 18 months. Not only do I think all of the colds, flus, fevers, etc. helped to build up his tolerance, but it also helped to teach my & Daddy exactly what to do & what not to do to keep him healthy (& when a doctor's visit is necessary or not). Live & learn, I guess! Here's to a healthy 2010! PS---apologies for speaking of my son in the 3rd person. Guess, as a teacher, I should take my own advice & proofread! !